Bumping along the road in pony and trap, with children cheerily waving us along the paddy field-lined way, Lombok seems a million miles from its tourist-packed neighbour, Bali. Marco Polo, our pony, clanks away with pink tassels and bells and we alight at Prawira village. 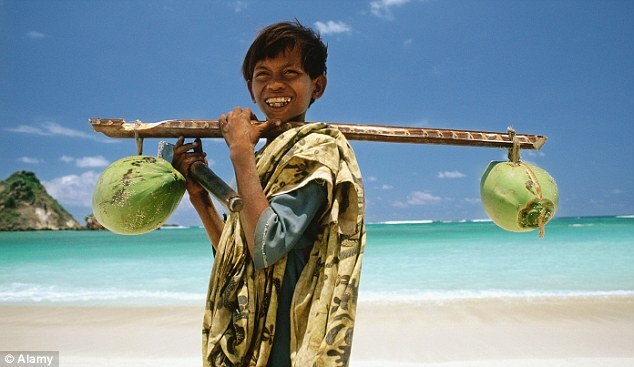 Here locals show us how they filter coconut oil, grow crops and make bamboo ornaments. The children yell hello and show us their spinning top games. The small Indonesian island of Lombok, between Malaysia in the north-west and Australia to the south-east, has attracted visitors since its new airport opened in 2011. But its infrastructure is basic and, unlike Bali, there are no taxis to flag down, no public telephones, and English is not widely spoken. Perfect for our honeymoon, my husband and I decide. While traffic is notoriously congested in Bali, there aren’t many cars in Lombok. Scooters whizz by with families clinging on, while others use a pony and trap. Chickens and the occasional tethered cow hang about on the roadside. We are here at the beginning of the rainy season, but the cooler air is a relief. It is warm enough to sunbathe in the morning before the heavens open for a few hours in the afternoon. If you don’t fancy the showers, their dry season is from now until September. Though the rain is itself a spectacle. We watch it bounce off roads while sheltering under the canopy of a bar with a cocktail. Dark falls quickly here after spectacular sunsets, and we dine most nights by candlelight. By day there are trips to Prawira village to nose around its pungent morning market. And boat trips to the beautiful Gilli islands, which you can see hovering on the horizon from the hotel’s beachfront. From here we snorkel with sea turtles among the coral reefs. Our hotel, The Oberoi, Lombok, even arranges for us to plant coral on the seabed, with a plaque showing our names and the date. We feel like the Duke and Duchess of Cambridge on tour. Lombok is a two-hour boat ride or 30-minute flight away from the much better known Bali, and as we are in the area it seems a good reason to compare the two. 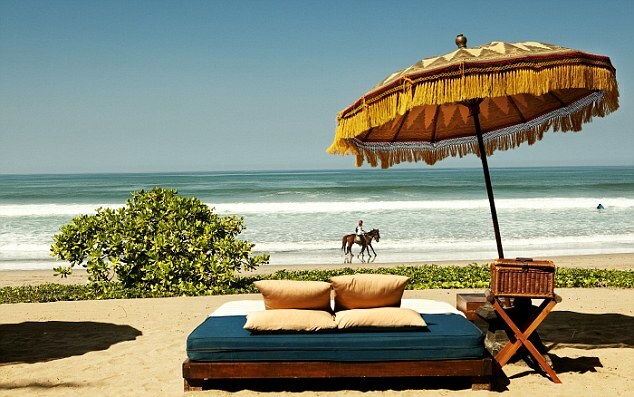 The Oberoi, Bali is near the upmarket spas and restaurants of Seminyak, one of the island’s most fashionable and busy spots. Couples, surfers and backpackers flock from the UK, U.S., France and Australia. Susan Sarandon and David Bowie are among the celebrities who have stayed in our hotel, which has been designed to recreate the atmosphere of a Balinese village, with restaurants serving local food and an amphitheatre. Some visitors are drawn to Indonesia hoping for an Eat Pray Love experience. As newly marrieds we’ve got the love part sorted, but it’s easy to see why people describe the islands as spiritual, too. Lombok is predominantly Muslim and we hear the daily call to prayer from our terrace, while Bali’s population is mainly Hindu. Outdoor temples such as nearby Pura Petitenget are made up of small courtyards with statues of gods and altars covered in black-and-white checked cloth. The check — kain poleng — symbolises the Balinese belief that the world is composed of opposing forces. 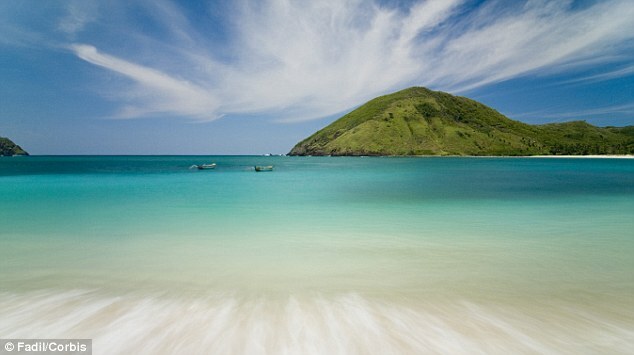 Both islands share the same friendliness, but for us, Lombok has the edge. Quieter roads, cleaner beaches and fewer people. When you can relax in such unspoilt beauty, what’s not to love.